No matter how large or small your family or living space is, you will invariably develop at least one “drop zone” in your home where things accumulate – the place where things get dumped when you walk in the door. Is yours the kitchen bench, dining table or couch? Maybe it is all of the above, and every time you try to leave the house you need to search all the dumping grounds for your keys and sunglasses which are not in the same place as your bag. Sound familiar? What about the ubiquitous pile of paper? Does yours include unopened mail for all family members, bills to pay, and forms to send back to school? Creating a central command centre to manage all of this will greatly improve the daily flow of items and activities, and save you time, energy and stress. 1. Decide what your command centre needs to contain. This will depend on the number of people in your household and the kind of activities each one is involved in. A good place to start is to look at the items currently in your drop zones. Typically these would include things like your bag or wallet, sunglasses, keys, mail, kids’ bags, shopping bags, laptop or iPad, etc. Most of these items simply need to be stashed somewhere until you leave the house again, but some of them require action to be taken, like mail, school notices, and dirty clothes in kids’ bags. Therefore your command centre will need to contain at least some storage space suited for large items like bags and small items like keys and sunglasses, as well as a place to put papers for filing and papers requiring action. 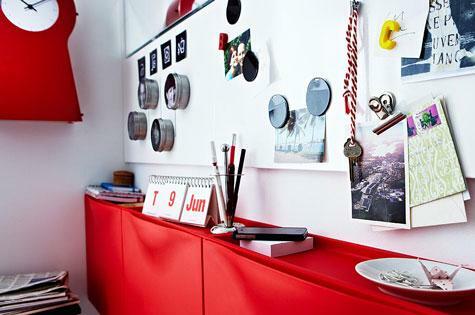 Remember the golden rule of avoiding clutter: touch it once! Don’t dump all of these items together with the intention of sorting them out later – a well designed and conveniently located command centre should enable you to place all these items in their correct place first time. 2. Choose a convenient and practical location for the command centre. Again this will depend on how many people need to use it, as well as the number and type of items you have identified in the point above. You need a space big enough to comfortably accommodate everything you need and allow easy access for everyone. Again – look at your existing drop zones. You are quite likely already using the most convenient location to dump your things, so it will be a more natural transition to locate your organised solution here rather than trying to change your habits entirely (assuming of course it is a safe and practical location to be using). Kitchens are a very popular choice as this is often the heart of the home and where everyone starts their day. 3. Design your solution based on what you need from point 1, and the size and shape of your area chosen in point 2. Your configuration may include a couple of baskets, some hooks, filing trays or vertical folders, a pin board and magnetic dry erase board or blackboard, and calendar. You may also choose to include your meal plan and shopping list. The options are endless! 4. Involve the family. Each person should take responsibility for their own items in the command centre. You are aiming to achieve that great virtue “a place for everything and everything in its place”. For example, the kids should know where their school bags and sports gear live and get into the habit of putting them there as soon as they walk in the door, as well as taking any notices out of their bag and placing them on the notice board. 5. Plan ahead and pack the night before. Use your calendar or family organiser to note all upcoming activities for each individual. Every evening you can refer to the activities planned for the following day and ensure you are prepared appropriately. Getting yourself ready to leave the house in the morning is a lot less stressful knowing all your stuff is packed and ready to go, instead of frantically searching for your umbrella or one lost soccer boot. What a lovely practical article - thanks Beverley and Motherpedia! As a childless professional woman who values order and abhors chaos, this article both informs and horrifies me.